The Milkman’s being milked and we’re being suckered! A lot of folks believe that raw milk is bad and big brother should ban it and anyone drinking it, processing it or dare to say anything good about it. Put them in Chains , is the battle cry of our protectors and those who do all for the common good! Just a minute here boys and girls, either Raw Milk is bad or it’s not. Read on.. The sale of raw milk directly to consumers is prohibited in under the Food and Drug Regulations since 1991. However, like the United States, Canada permits the sale of raw milk cheeses that are aged over 60 days. In 2009, the province of Quebec modified regulations to allow raw milk cheeses aged less than 60 days provided stringent safeguards are met. The truth of the matter is the Milk Marketing Boards don’t get their share of the swag if they don’t control production and the market. How much milk gets dumped every day because the farmer has met his quota and has no market for the extra? How many farmers are farming something less profitable because they can’t get quota?? How many low income families do without milk because they can’t afford to buy it?? Reality check my friends Mr. Schmidt won! He jumped the bars and met the standard. He did so by once being convicted and changed his ways to conform to the rule, the Simple Serpents couldn’t have that, so they entrapped him yet again, recharged him, under different rules, lost and now are appealing their loss. Now the Province is appealing! What the hell is this? McDinky had the balls to go an television and state that the Province has to look our for any miscarriage of justice, so the Province is bound to appeal. Let’s get a grip people. How much are we going to spend beating this dead horse? Why is Michael Schmidt forced to spend hundreds of thousands of dollars defending his right to make a living and for your right to h,ave freedom of choice. Are the Ontario people so stupid that they can’t decide what they want to eat or drink on their own? Evidently, they are as we the people of this Province are paying tax dollars to Simple Serpants to fight us from making our own decisions. In the early part of this century the Simple Serpants told us that alcohol was bad and banned it, prostitution was bad and they made it illegal, gambling was bad and they banned it, drugs were bad so they outlawed them, today they are generating their revenue controlling those same things. H E L L O !!!! Wake up Ontario smell the milk! The Simple Serpants are using raw milk to strip mine your rights under your nose and using your money to do it! Send some money to Schmidt to help him fight them for you!! Go to www.glencottonfarms.com get the other side of the story. Stick your head back in the sand and understand you will be referring to each other as comrade! I cannot believe ny eyes and or ears! Mayor Gwen Gilbert actually got support from the Red Bay Bandits in appointing Shane Sargent as the new events coordinator!! I don’t know how she did it!! Bootlegger Ray, Betty the Beauty, Dan the Man, Wunderdick, Yvonne the Wonderful, Stan the unman and Ana the Bannana, must of had too much of Ray’s Special blend, they actually voted for something that made sense, without calling the cops or seizing somebody’s computer. The efforts of Mayor Gwen Gilbert to get recognition of Shane in the first place, was a challenge but to make it official, my God! There must be an election coming or something! I am sure ,they figure if they follow the true leader for a few months, maybe the electorate will forget their stupidity of the last three and one half years. N O T!!!! The Willie Festival was outstanding! The festival was dying a slow death until this year thanks to the efforts of Mayor Gwen Gilbert and of course Shane and all those that helped her!! We can tell it was going well when The Red Bay Bandits arranged through, Dan the man Kerr to have Mr. Close selling tickets at the front door with none other than Dan the Man himself. I guess Mr. Noble sanctioned the appearance cause I don’t think Dan the man could have figured that one out by himself. Interesting to note that Dan the man isn’t registered to run in the next election. Hmmm? Guess Mr. Close is officially getting his endorsement. I wonder how much Red Bay second hand booze, Bootlegger Ray had to pour down him to get that kind of support. Mr. Noble must be so proud! I am waiting for the numbers to see how much money the local economy got pumped into it as a result of this event. I know that all the press received audda boost this summers tourism numbers dramatically. I know that Mayor Gwen Gilbert, as per usual takes second place to all the people that organized this event, its her nature. The fact remains that given the adversity she has had to deal with, I am truly amazed that she got support of Council to hire Shane. Good work Gwen!! As the existing Council enters the winter of their term, I only hope they give Mayor Gwen continued support that she deserves. Maybe even allow her to use her office and Blackberry (did I write that down) Naw, they wouldn’t do that , it might prove she was right in the first place. Couldn’t hope for that. Hell if Mayor Gwen Gilbert, had tools to work with she might be able to do her job effectively and achieve more. Can’t happen! The Red Bay Bandits might look bad! The notorious Red Bay Bandits are going to have a hard time, beating down a true winner if they do their jobs! Without picking at Mayor Gwen Gilbert in the press how are they going to have anything to say?? They can’t condemn her for the Wiarton Willie Festival. 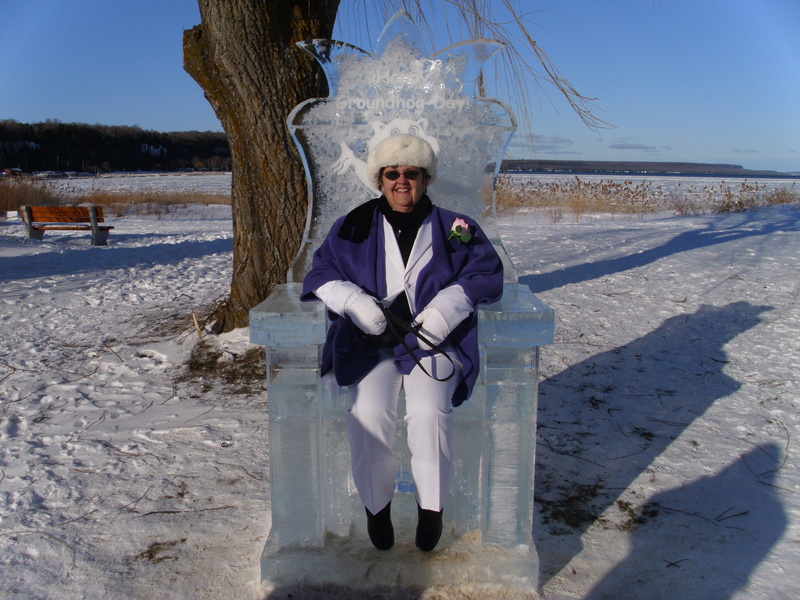 The truth of the matter is that the Wiarton Willie Festival made the town shine in the eyes of the world and Mayor Gwen Gilbert shone with it, much to dismay of some. It ceases to amaze me that certain members of council can paint the kettle black! Mr. Lamont, supporter of Mr. Close the up and coming candidate for Mayor, maintains butter won’t melt in his mouth. Accusing Mr. King of fraud. GET A GRIP! While Mayor Gwen Gilbert was in Haiti doing Gods work and helping those devastated in the earthquake, Mr. Lamont, started beating on Mr. King for of all things mileage over charge. Guess he figured that he couldn’t justify attacks on Mayor Gwen Gilbert so may as well stir the pot shooting at Art King. I cannot believe that Yvonne Harron, who at times seems to be somewhat coherent, would allow this nonsense. Maybe she is joining the bootleg crowd and supporting the Red Bay Bandits in their quest for a coup detat next October. I have watched Lamont, Kerr, Heath, Harron and Betty the Beauty Hall supported by Vukovic and Wunderdick manipulate the system to get their way far too long. To think that they are supporting Lamonts bum buddy in the next election is just plain scary. Think the pipe line was beaten, just wait and see if these bozo’s are let loose without the commonsense approach of Mayor Gwen Gilbert. Hell I can see it now Wiarton Willie taking up office with Lamont doling out shots of vodka, with his mileage meter in hand, in cool February air, with Hall , Betty the Beauty and Vukovic all dolled up in cheer leading outfits and Wunderdick leading the band. Kerr will not be there, cause he will be off in the back room cutting a deal with some of the old boys on how to build the pipe line to Sauble, making everyone else pay for it. They will all have Blackberry’s in hand beating the drum and selling us all down the road. Willie will be the only one making sense, although he screwed up saying there is six more weeks of winter cause if these clowns are driving the bus it will be a long cold four years. What a thought! Ponder this while you try to balance your cheque book this month. On a brighter note, the Wiarton Willy Festival led by Mayor Gwen Gilbert was a smashing success! What an outstanding job! Made me proud to be a part of the Bruce. Mayor Gwen Gilbert, played a big role in getting the right people in place to make us all proud of our little town while it had its five minutes of fame. I applaud her and her efforts. My hats off to Gwen Gilbert for having the ability to be so positive at this event given she was trapped in Haiti helping people in such a mess and was able to be back to lead the band so to speak at the Wiarton Willy festival. It must of been very hard for her to smile and be a leading force knowing that her friends in Haiti remained there still trying to scratch out an existence. It is hard I am sure for Mayor Gwen Gilbert to walk arround with a smile with all those knives in her back! Three cheers for Art King who held the fort while Gwen was gone. Without his integrity, I am sure that a lesser man would have thrown in the towel, unless of course the lesser man was using his towel to wipe up the spilled vodka he was doling out, not to mention any names like Lamont. Hopefully the people of South Bruce Peninsula will see the goings on of the Rad Bay Bandits for what it is. I know that I will continue to monitor and expose things for what they are in the months to come.